If ever we needed a reminder of how hot, dry and unforgiving the Australian climate can be, it came this weekend. The bushfires that swept Victoria over the weekend (and are still continuing) have already claimed 108 lives and 750 homes, making it one of the worst natural disasters in Australia’s history. That’s on the back of a debilitating heat wave that has swept over South Australia and Victoria over the past fortnight with 35C plus temperatures and ridiculously low humidity scorching an already dry land. Tom Carson, previously of Yering Station and now winemaker at Yabby Lake, apparently lost his own personal vineyard in the fires. Our thoughts go out to him in this rough time. 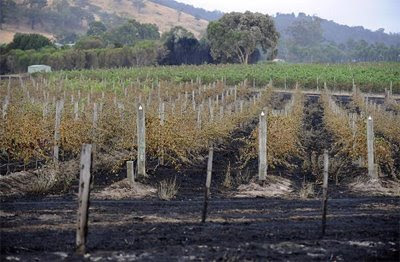 Aside from the fires, the extreme heat has served to destroy this years crop for more than one producer, particularly in Langhorne Creek & McLaren Vale, with crop losses expected in the Barossa, Clare Valley, Coonawarra & Limestone Coast. In Victoria, the poor Yarra has lost up to a quarter of its crop, the Grampians even more so. The always entertaining Mr White writes about it here with some harrowing stories from the producers mouth here. It’s hard times all round if your a vigneron in South Australia and Victoria. Its scary, hard, harrowing stuff all round – good luck to all those battling the conditions, those still threatened by fire, those staring at a vineyard full of sunburnt grapes and everybody else touched by the extremities of the Australian climate at present..
Close calls for some Yarra wineries here sadly bad news for Roundstone & Mandala cellar doors however (here) more information here at Decanter. Fire on top of drought related stress. Yes its a bugger of a time in the Yarra. This from great Yarra winery Warramate that I visited just 9 months ago. “Yarra Yarra has been burnt by the devastating fires in Steels Creek on Saturday 7th February. Sadly many lives have been lost. Most importantly we are safe, but have suffered significant losses in both the winery and vineyards, however we are still operational. It seems a little morose to be reporting this (disrespectful almost to call it an update), however well regarded wine distributor Rob Davey (who was based in fire ravaged Kinglake) has also been confirmed as a victim of the fire, along with his young family (more here). Davey wine merchants are the East Coast distributors for Mt Billy wines, No.1 Wine Company and Fairhall Downs amongst others. Condolences to his family.